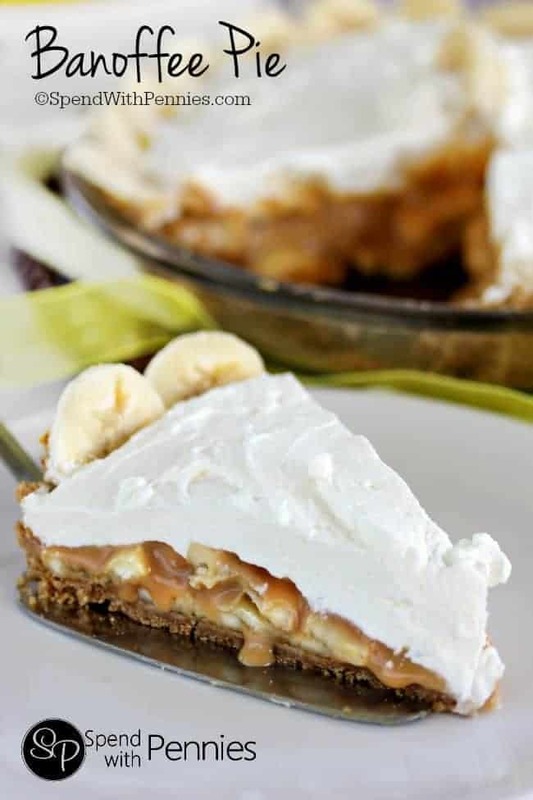 Banoffee Pie is a delicious and easy pie with layers of bananas, dulce de leche and whipped cream! This simple dessert takes just minutes to prepare and everyone absolutely LOVES it! Banoffee pie is an English dessert that has been around for years! I actually learned about this yummy concoction from my sister! Banana + Toffee = Banoffee! 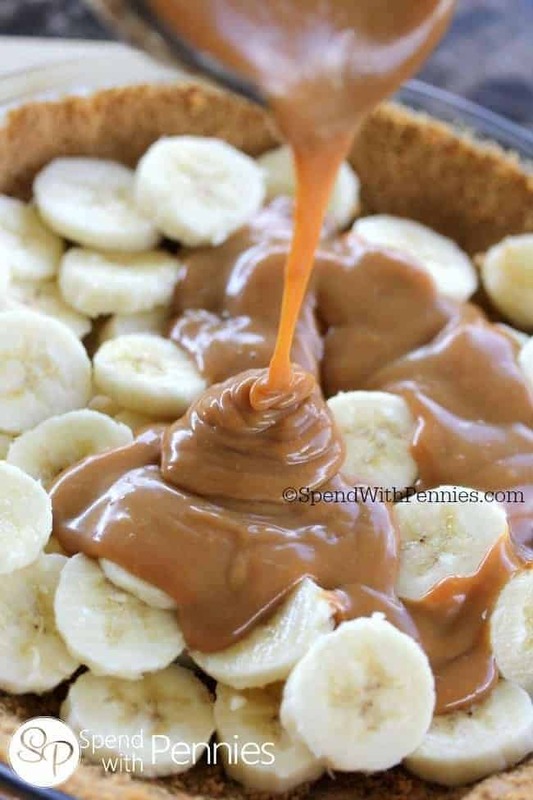 Banoffee pie starts with a pie crust filled with fresh banana slices. The slices are topped with a delicious caramely dulce de leche (which I make from sweetened condensed milk) and finally freshly whipped cream. This pie is best eaten the day of or the day after you make it. Because of the fresh bananas, it doesn’t last very long in the fridge and it doesn’t freeze well. It’s really easy to make, no baking required! 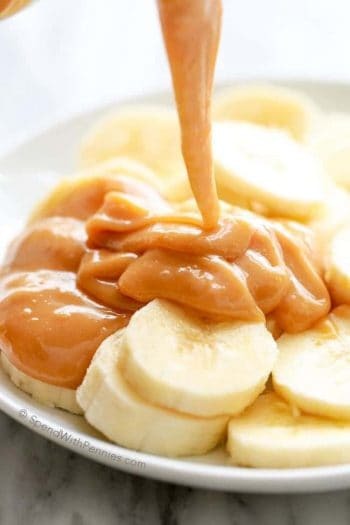 The dulce de leche in this recipe is made by creating caramel out of sweetened condensed milk (I always use Eagle Brand). I used to boil the can but I now make it without boiling or substitute store bought dulce de leche. 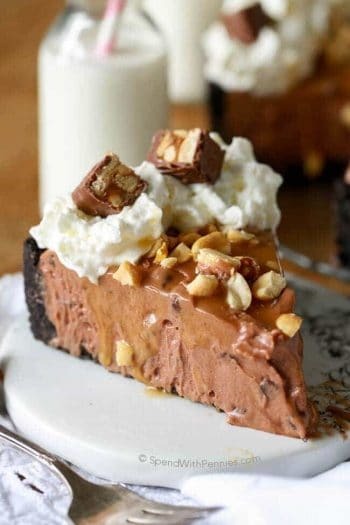 To make the caramel I pour condensed milk into a pie pan or casserole dish. Cover it with foil and place it in a larger pan of water and bake. If you do choose to boil your sweetened condensed milk, it is VERY important that the can is covered with water the whole time so you will need to keep an eye on it and top up the pot. You’ll also want to make sure it’s completely cooled before opening the can. 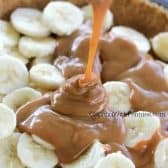 I use a graham pie crust in this recipe because I love the flavor of graham with banana & caramel but you can most definitely use a traditional baked pastry pie shell! Banoffee pie is an English dessert that has been around for years! Pour one can of sweetened condensed milk into a small casserole dish and cover with foil. Place in a larger pan and fill to 3/4" with water. (Fill water as needed while baking). Bake at 425F 60-90 minutes or until condensed milk has reached a golden brown color. Cool completely. Slice the bananas and place them into the bottom of the crust. Pour cooled condensed milk over top. In a large bowl, whip cream, sugar & vanilla until stiff peaks form. Top pie with whipped cream and refrigerate for 2-3 hours. If using store bought dulce de leche, you can skip the step of cooking the condensed milk.